Best Western Barkly Motor Lodge Ballarat, Hotel Australia. Limited Time Offer! The BestRead more Western Barkly Motor Lodge is a two star Luxury establishment has all the comforts such as : Restaurant, Room Service, Bar, Laundry services, Free Parking, Television, Air conditioning.It is situated at 43-57 Main Road in the east section of Ballarat, at only 4 minutes by car distance from the center.Take advantage of the spa & health center which is available at the hotel.It is part of the hotel chain BW.This hotel offers high speed internet.This hotel offers a unique service : wheelchair accessible.Other useful information:This hotel has a free parking. The Best Western Barkly Motor Lodge is a brand new motel-offering guests fully licensed restaurant for lunch and dinner as well as room service meals. It is centrally located less than a mile from the city center, close to sovereign hill, gold museum, and parks. 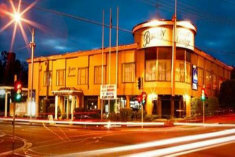 This 4 star hotel is located in the city centre of Ballarat. The Hotel has a coffee shop. All 21 rooms are equipped with minibar, hairdryer, ironing set and air conditioning.